Nothing can be more painful than to be always excusing yourself from someone else using the kitchen at the same time as you, shifting around to make room, closing doors and drawers to open the refrigerator door or the dishwasher door. We no longer want to be the owners of a house with a tiny, dingy kitchen with clutter lying everywhere, things balanced on top of each other since the space available is not utilized efficiently, or cupboards and cabinets are not built functionally. Function in any kitchen is just not to cook & clean, but also for other family activities, computer work, eating, doing arts & crafts and so much more. The other very important function of a kitchen is to provide ample and functional storage for extra utensils, extra table linen, appliances, dry food items, bins, storage jars, extra cutlery, extra tableware and so much more. 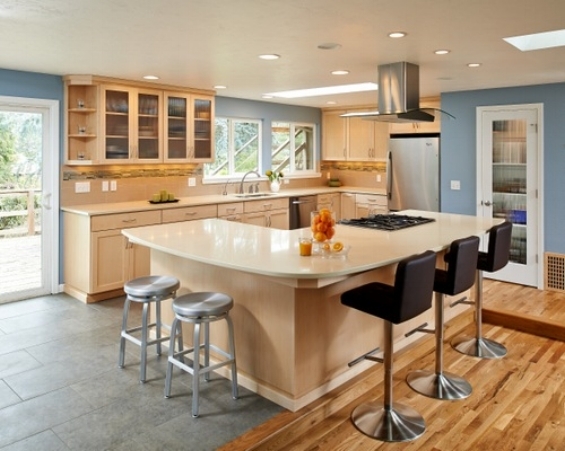 So modern kitchens are fitted in and planned with keeping in mind all these activities and functions. Hence efficient planning and design has become so essential. We live in our kitchen, not just cook. Kitchen Design is now a science of our lifestyle and choices and requirement of all individuals in the family need to be taken into account. Do you have a kitchen that needs proper planning? Get a consultation set up with our Designer today.